Hosts were friendly and welcoming. Pool was nice. Everything was very clean - even the towels and bedding was changed every day (although I would personally rather this not the be the case - as it's not really necessary and not at all eco-friendly - and some more investment in the accommodation was made instead). The sea views from the veranda were amazing (see my pics). Nice to have a large airer to dry towels on etc on the balcony. There is a washing machine for guests to use but note that you have to pay extra for it. Note that bathroom towels are provided but beach towels are not. This was perfect for two families with young kids to relax and visit the location area. The pool was great, the local shop had everything we needed, the local beaches were awesome, there was a local winery close by, the ferry to Zante was 5 min drive and the host cooked us a wonderful BBQ...we would defn stay again !! The owner was so friendly and made us feel so at home. The swimming pool and outdoor garden area was so beautiful. We have just returned from Amazona Apartments and Studios. The apartments are clean and well kept. The grounds are beautiful with lots of hammocks and sun loungers to relax in. My boys loved the pool. It is a bit out of the way, which we love. 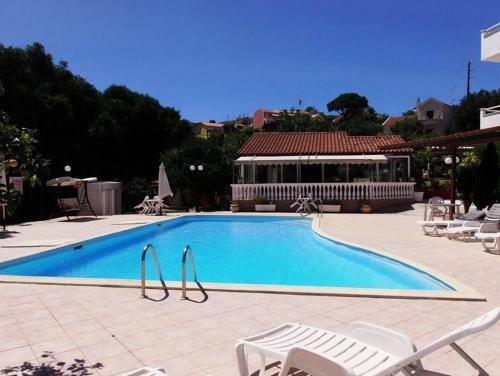 It is 10 minutes walk up a fairly steep hill to Spartia village with its shop, coffee shop and Taverna. We really loved the village and the beaches nearby. To get to the beach and travel further afield, it is better to have a rental car. Lefteris and his wife who own and run the apartments are lovely. I hope we can come back soon. Beautiful setting, lovely pool! Hammocks in the trees so relaxing. Owner so nice and such a warm welcome! Really lovely start to our holiday! Lefteris was a brilliant host. Very friendly and gave us local lifts to the beach. It is a lovely quiet location. The views are great and loved the garden space particularly the hammocks and treehouse. Food is lovely. The welcome was brilliant, we booked this as a last minute accommodation as our flight was cancelled and they were very accommodating and the price was good. We only stayed one night but the garden and pool were beautiful and a brilliant safe place for young families with lots of hammocks and swings etc. but not commercialised, very Greek in a good way. 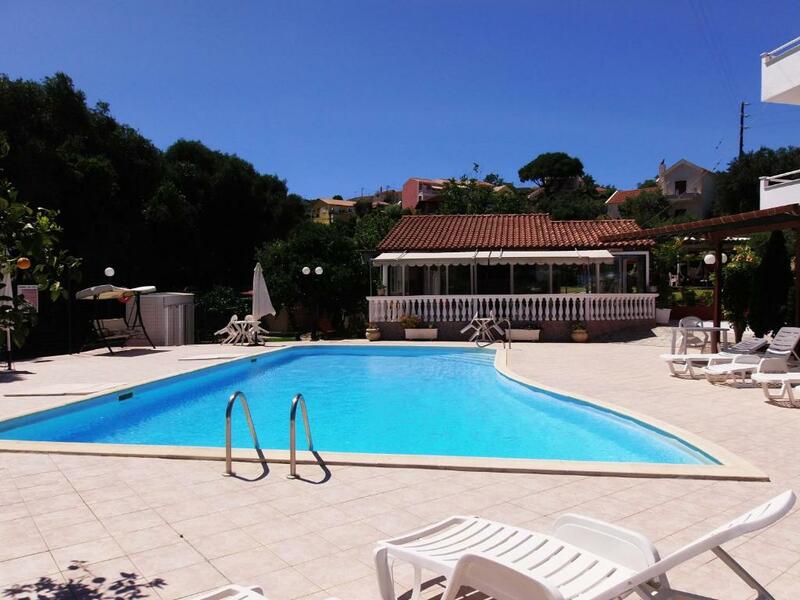 It is close to the village square where there is an excellent taverna, two good welcoming shops and cool café bar, the road up is a little steep in the heat but not a problem. The views from the apartment. The quiet location . Only few minutes drive to Argostoli which was great. The location is stunning, in a remote quite area. Unfortunately we were only here for such a short time as it was only a stopover after our flight before we left for another island. 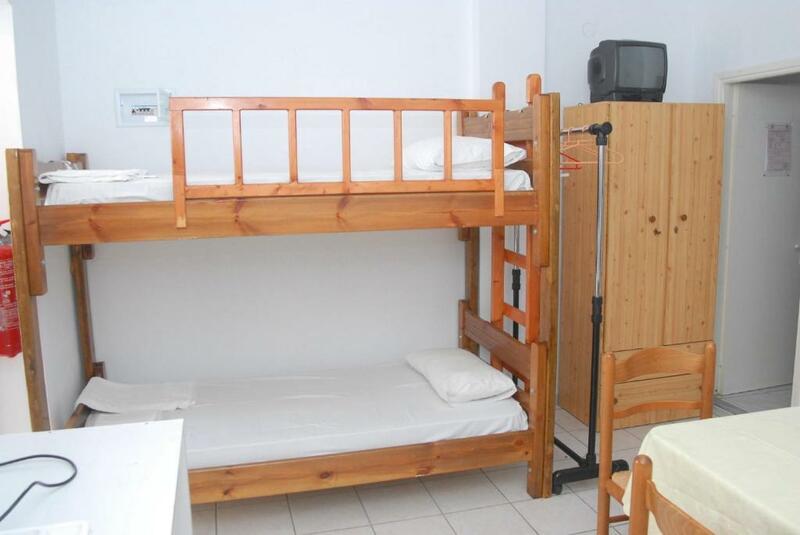 Comfortable and clean room with everything you need. Very powerful air con was a dream. The start we're so pleasant and did everything they could for us including dropping us to the ferry super early in th morning! Honestly they were beyond kind. 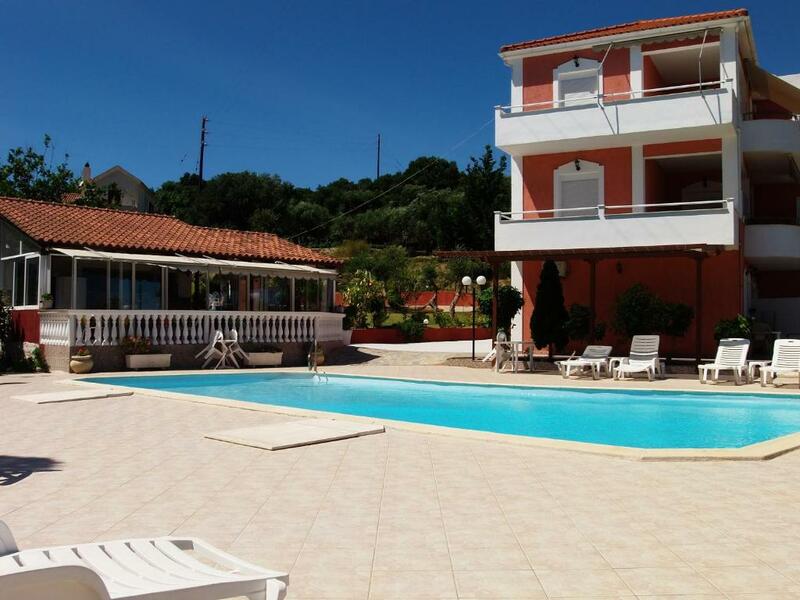 Lock in a great price for Amazona Apartments and Studios – rated 8.5 by recent guests! 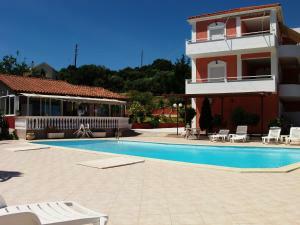 Set amid lush olive groves, Amazona Studios is 1,950 feet away from Klimatsias Beach, in the village of Spartia. 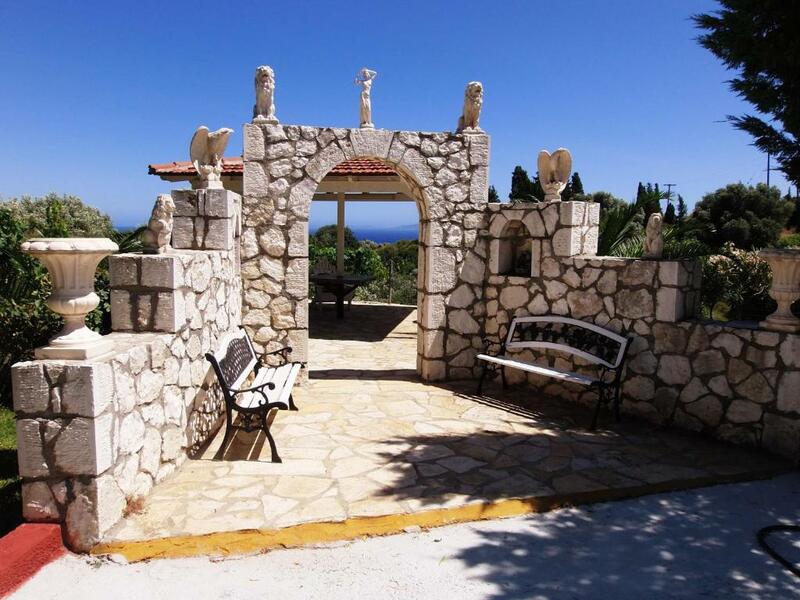 It has a swimming pool, a snack bar and offers self-catering accommodations overlooking the Ionian Sea or the well-kept gardens. 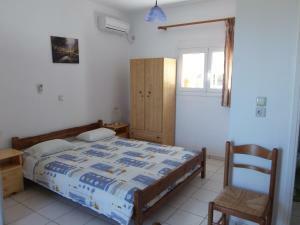 Amazona studios and apartments are bright and air conditioned with tiled floors. Each comes with a kitchenette with mini fridge and electric kettle, a TV and private bathroom with shower. Guests can spend relaxing moments by the pool, while in the 7,000-m² garden they can find hammocks, a table-tennis table and shaded seating areas. The on-site bar serves refreshing drinks, ice creams and light meals upon request. Within 650 feet from Amazona, you will find a super market and restaurants serving Ionian cuisine. Kefalonia Airport is at 4.3 mi. Free Wi-Fi is available in the common areas. When would you like to stay at Amazona Apartments and Studios? Overlooking the Ionian Sea from its balcony, this air-conditioned studio comes with a kitchenette and a TV. Located on the ground floor, this air-conditioned studio enjoys garden views and includes a kitchenette and a TV. 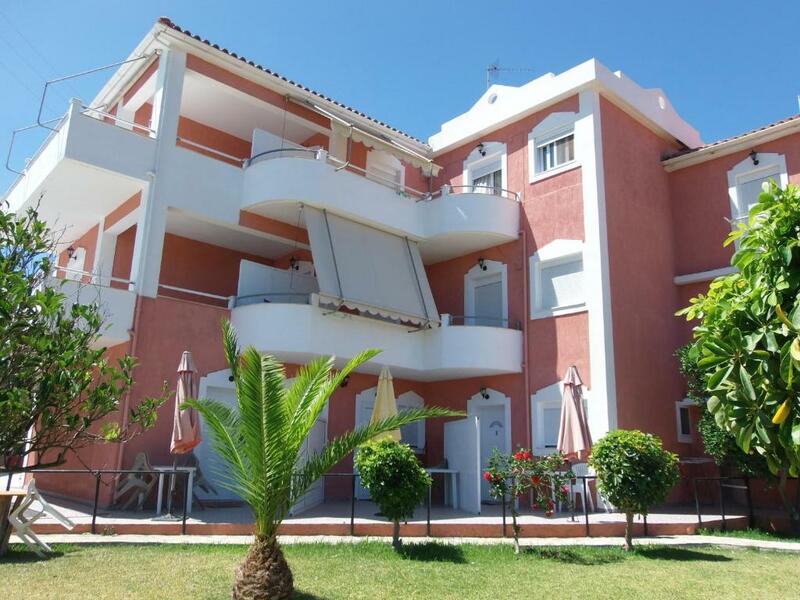 Featuring a separate bedroom, this air-conditioned apartment comes with a kitchenette and a TV and opens out to a balcony with Ionian Sea views. Featuring 2 separate bedroom, this air-conditioned apartment comes with a kitchenette and a TV and opens out to a balcony with Ionian Sea views. House Rules Amazona Apartments and Studios takes special requests – add in the next step! Amazona Apartments and Studios accepts these cards and reserves the right to temporarily hold an amount prior to arrival. The hosts are lovely & friendly however they could do with investing some of their takings back into the accommodation to make it more comfortable for their guests. Had other guests left some more factual reviews, we probably wouldn't have stayed in these apartments. 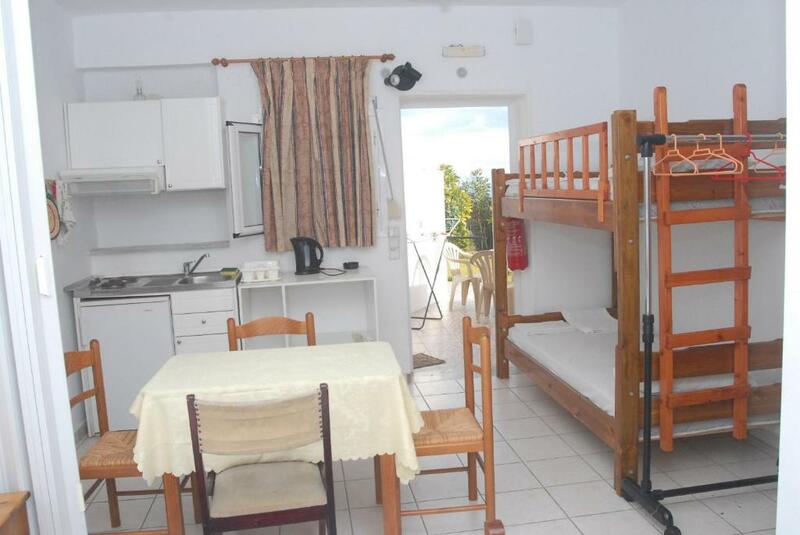 I realise it's cheap but I think we could have booked much better for the same price Considering this is a self-catering apartment, the kitchen could have been much better equipped. There was no corkscrew, serving spoons, wooden spoons, tin opener, frying pan. salad bowl, chopping board & chopping knives. Inexpensive but essential items such as salt, pepper, sugar, oil & vinegar would have been much appreciated & extremely useful There was no full-length mirror at all & would have been v useful. The shower was leaking & meant the bathroom floor was wet most of the time which was not only not v pleasant but also caused a constant slip-hazard. The shower doors were v old & rickety & the shower head broken The wiring above the kitchen hob & the bathroom sink looked extremely dangerous as was the kettle lead behind the sink (see pics) If you are looking for a quiet get-away, I wouldn't recommend this place as unfortunately one of the neighbour's dogs barked a lot of the time (day & night) & the sound of the wooden chairs scraping along the floor in the below apartments echoed through the walls and woke us up on several occasions. Some mats/carpets on the floor and/or some rubber cushions on the legs of the chairs would make a world of difference. Due to the noise (& BBQ smoke) we couldn't sleep at night with the windows open. The A/C unit was rather old & inefficient & I had to buy a fan so that we could sleep at night (to give more breeze & drown out the barking dog etc) The mattresses had no protectors on them which would seem more hygienic. This unit is a classic example of bait and switch as we were shown a picture of a four story building with balconies and views of the beach and pool. When we arrived, we were shown past a converted trailer, to a converted shack. There was a table and chair at the entrance to the shack. When we entered the shack, we notice a room approximately 10 by 10 feet which contained the following items and layout: On the far wall was a twin bunk bed. Directly in front of the door was a small table and four chairs. To the left was a small stove, sink and tiny refrigerator. The small cabinet contained four dishes, four glasses, and forks and spoons for four. There was not even salt & pepper or a napkins in that makeshift kitchen. On the right wall was a couch that flattened to a twin bed. The air conditioner was on the front wall directly over the couch/twin bed. Between the table and couch/bed there was a narrow space to walk to the hall leading to another small bedroom with no air conditioning and further down the hall to the very small bathroom/shower/sink. We had rented this unit for 3 adults and 2 children. It was the worst unit of all that we had rented. I told the owner that the unit was not adequate and that I wanted to change to the main house. He said it was full but that we could change the unit the next day. It was also getting dark and the children were hungry and wanted to go out to eat. The next day my husband approached him about moving to the main building, but the owner said it was filled and that we could have had it the day before. ( A complete and utter lie) The owner stated that fruit trees and garden plants were organic yet the next day we saw him spraying plants all around us with a mask covering his face. I became so ill that night that we were unable to leave and find another place to sleep. The night was never ending with me getting a fever, and no air conditioning in that small bedroom. The bad well outweighed any good. Our accommodation was very tired and not brilliantly clean, but we were in an overspill separate apartment and it was exceptionally late notice for the hotelier. To be fare the main accommodation block which had the rest of the apartments looked beautiful and very well kept. We were very welcome of a bed as our airline had let us down and would definitely stay again. Husband taken ill and spending second week of holiday in hospital but the owners were extremely helpful and took me to and from hospital every day. They couldn’t have been more helpful. Te wifi was a bit slow. The owner was super kind, the place is very nive, it has a huge garden with hammocks. The rooms were clean and comfortable. 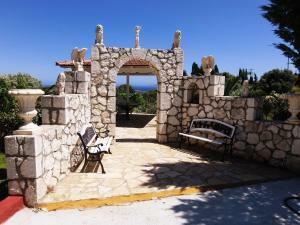 Lefteris was a very welcoming host & made us feel very much at home; the grounds are also lovely, very peaceful & relaxing. If you are looking for a quiet location with lovely views to relax in, this is it. it was an ideal place from which to explore the Island, but you do need a car to see this beautiful Island. The village was just a 5 minute walk away and the beach just down the road.